Mountains are really a spectacular show of nature's force and rugged beauty. Imagine how the earth's crust, made up of tectonic plates, floats on the surface of our world. Globally, these plates, whether they be continental or oceanic, are in a constant state of change, as pressure builds, pressure is released, plates separate and plates come together. It is when the pressure is too great and the plates collide, resulting in great lifting, that mountains are created. 65 million years ago, this building pressure formed what we know today as the Rocky Mountains. Once the location of many tropical inland seas, Alberta is a treasure trove of ocean and dinosaur fossils which can be viewed at the Royal Tyrrell Museum in Drumheller. Let's move on to the last ice age which we believe began around 70,000 years ago and ended 10,000 years ago. Canada was covered with massive sheets of ice. These sheets of ice flow and as they do, they dramatically change the landscape, carving vast valleys and moving huge masses of rock. Slowly, the temperatures rose, the ice began to melt and vegetation began to flourish. When you come to visit us here in western Canada, you can visit the high peaks of the Western Cordillera. In terms of mountains, this mountain chain is quite young, the result of 160 million years of pressure between the Pacific and North American Plates. The Western Cordilla consists of an 800-kilometer wide series of mountain belts along Canada's Pacific coast. 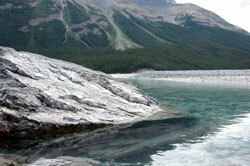 The Coast Mountains form the western barrier which boasts Canada's highest peak, Mount Logan. The Rockies form the eastern barrier and span from the Yukon border south to Mexico. On the western side of the front range of the Canadian Rockies is a huge valley, called the Rocky Mountain Trench. To the west are the Columbia Mountains which include the Purcell, Selkirk, and Monashee and Cariboo Mountains, world-famous for the great heliskiing! Although these are not considered to be "the Rockies", they border the Rocky Mountain Trench and are therefore often mentioned when speaking about the Rockies. It is here in the Canadian Rockies that you will find the Continental Divide. The melt waters on the western slopes will flow westwards to the Pacific and melt waters on the eastern slopes flow east to the North Atlantic via Hudson's Bay. Famous for its stunning mountain vistas, rugged landscape and inspriring glaciers, the Icefields Parkway is considered one of the world's most scenic highways. This highway takes you through beautiful mountain valleys and past sparkling glacier-fed lakes as you go from Banff National Park to Jasper National Park. At the end of the Icefields Parkway you reach the Athabasca Glacier where you can then go on an Ice Explorer or go on an Icewalk to experience the glacier firsthand. Banff, Jasper, Kootenay and Yoho National Park, together with Hamber, Mount Robson and Mount Assiniboine Provincial Parks are recognized as The Canadian Rocky Mountain Parks World Heritage Site. Yellowhead Pass (1110 m/3642 ft): The Yellowhead Highway (#16)and the Canadian National Railway or CNR use the Yellowhead Pass. Kicking Horse Pass (1627 m/5339 ft): The Trans-Canada Highway (HWY #1) and the Canadian Pacific Railway (CPR) use the Kicking Horse Pass. Crowsnest Pass (1358 m/4457 ft): Highway #3 and the Canadian Pacific Railway use the Crowsnest Pass.